If 97,000 Instagram followers don’t prove her success, her industry awards and stunning photographs do. Based in LA, Natasha Amrita Singh got her business idea from a few mindless doodles. Fast forward a few years and she decided to quit her successful banking job and turn her hobby into a career. Despite the time difference, her busy schedule and the fact it’s the middle of wedding season, Natasha was more than happy to take some time out and talk all things henna. Inspiring, hard working and passionate, Natasha is one lady who proves it really is never too late to take a leap of faith and follow your dreams. So Natasha, you’re now famous for your designs, but where did your interest in henna first stem from? Henna was honestly a complete accident. Prior to 2009 I had no clue that I could draw, or that I had good hand dexterity. I was working as an operations specialist in a call centre at a credit union and one day I thought to myself ‘hmm, I haven’t had henna in a while, my cousins need to hurry up and get married!’ Bored at work, I googled some photos and started doodling while I taught clients how to use their online banking and listened to them complain about overdraft fees. After a few doodles of flowers and paisleys I thought to myself, oh wow that’s not so bad. I continued drawing that week and a few days later I picked up a henna cone at a local Indian store. I haven’t put it down since. Six months after starting my henna craze, I realised that I enjoyed doing henna more than my banking career. I did hair and makeup for my friends and family for fun, so I figured I might as well get paid for it right? My parents are South Indian and Punjabi, so deciding to focus on cosmetology wasn’t really received with open arms. Indian parents in general would rather you become a doctor, engineer, or lawyer. Leaving my banking career was tough, but it was honestly the best decision of my life. My parents were extremely hesitant about it too, but now they’re my biggest supporters. My mom referred me to my first henna bridal booking in January 2010; right around the time I decided to quit m job and enrol into cosmetology school. Two years later I graduated from the cosmetology and aesthetician program from Gary Manuel Aveda Institute in Seattle, Washington. Extremely important! I got onto Instagram just a year and a half ago and was dreading it at first – the thought of taking care of one more social media page didn’t excite me, but it honestly changed my life. Instagram in my opinion, is this generations Google or Yelp in one. It’s a place for clients to view your portfolio, get to know you personally and read comments and reviews from real people. Social media has opened more doors than I could ever imagine. Where do you find the inspiration from for your designs? Everything and anything can create inspiration – everything from a pattern on a dress to a design on a napkin. Since I was completely self taught, I can definitely say other artists have inspired me as well. We all inspire each other, just like every industry with artists. 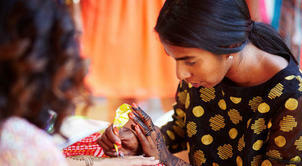 Traditional henna designs consist of flowers, paisleys, leaves, vines and mandalas. A lot of henna patterns are a combination of this, but in different orders which makes each design unique. In your opinion, what are the main things to remember when learning to create henna? Some key things to remember would be to always use 100% natural henna. 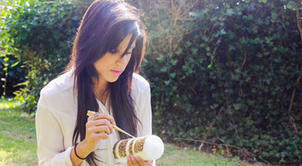 Some companies sell henna cones with PPD in them, which is an extremely harmful chemical. Remember to wash your hands with soap and water prior to any application and try using a fine tip cone to help achieve a cleaner design. The darkest stains appear on women that have the most dead skin on their heads and who avoid water the longest after henna has been applied – the recommended time is four to five hours with no water. Using oil on your hands after you have washed them will also enhance your henna stain. I find it difficult deciding what my proudest moment is because I am so grateful for all the doors henna has opened up for me. Two that really touched me was having the opportunity to work with Christina Milian, who I have been a fan of since I was a little girl. I was also recognised by the Professional Beauty Association in 2012 with a Beacon Award; this is a prestigious award only given to 100 students who are picked to attend North American Hairstyling Awards (NAHA) in Vegas – they are like the Grammy’s for hair! My submissions were a combination of hair, makeup and henna all created by me. I won this award right as I was graduating from beauty school; it was an incredible feeling starting my career like that. Do you always have a design in mind, or do things develop as you are painting the henna? When working with Indian brides they almost always have a design of choice for their wedding day. If I’m working on bridal party or at my shanti bar, 80% of the time I free hand designs. Traditional Indian weddings are huge; bridal henna application can take two to five hours, then I move on to the bridal party which can be anywhere from 20 to 80 people. A lot of henna artists draw whatever comes to mind and this is what is preferred by most. The time goes much quicker if you are not following a pattern. What do you do when you go wrong? If you make a mistake with henna you have about 15 seconds to quickly wipe off the henna stain before it starts soaking into the skin. Henna is not permanent with the stain only lasting seven to ten days. Buy a really great camera, get on social media, set up a website and network like crazy. Never leave home without a business card, try to have henna on your hands as frequently as possible and practise, practise, practise! I see so many artists or beginner henna artists that are so hard on themselves, but henna really has a lot to do with muscle memory. The more you practise the better and faster you will get. Finally then, do you think henna is becoming more popular and if so, why? I honestly feel that pop culture had a huge part in this. About a year ago Rihanna wasn’t on Instagram, but when she hopped back on I got a rush of inquiries for henna – clients wanted the same design as her hand tattoo, but in henna. Even though Rihanna has had that tattoo for years, most people never noticed till they followed her. I’ve been doing henna for almost five years now and it’s been in several cultures around the world for centuries, but I’ve seen a huge increase in inquiries over the past year. It’s beautiful to see North America so in love with henna, so thank you pop culture and of course Rihanna! Thanks Natasha and best of luck with it all. If you are itching to have a go, why not take a look at some of the henna courses listed on Hotcourses? With plenty of options available, whether it’s for a new hobby for a dream career, we are here to help.